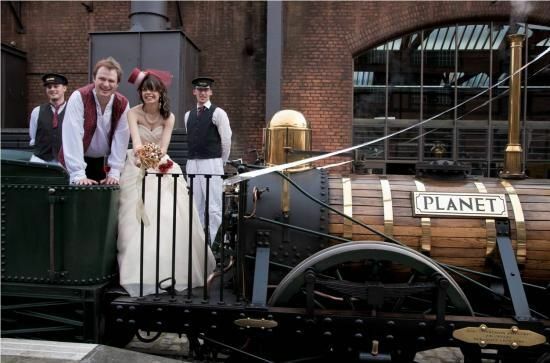 Located on the historic site of the world’s oldest surviving passenger railway station, housed in five listed buildings, MOSI’s amazing galleries and outstanding collections can provide a stunning backdrop for your Special Day. From your initial enquiry our dedicated events team will be on hand to cater for your every need. We can advise on menus, decorations, entertainment and we will be there to meet and guide you through your Wedding Day. MOSI is a licenced venue for civil ceremonies. You can conduct your ceremony in the unique setting of Station Masters House, have drinks on the station platform before being transported to your reception on Planet, MOSI’s steam train. For your reception why not dine in the unique setting of the Power Hall? Home to one of the world\'s largest collection of steam engines and locomotives. For an even greater impact, presenters can be booked to operate the machines as guests enter the hall.